I remember when I first saw Sneeze Breeze, possibly on Chalkboard Nails, and I distinctly remember the WOW I uttered. 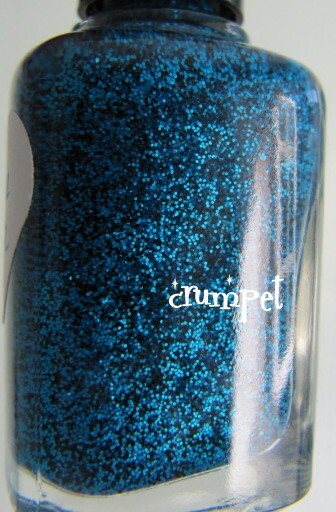 Here was a glitter that was a traffic-stopper. Intense, complex and dramatic .... and yet I didn't immediately go and buy it. Initially, I started putting this on without a base colour, thinking it would opaque up quite quickly, but after putting the 2nd coat on 1 nail, I changed my mind and went initially for a base of black. The base colour definitely evens out the application. All the fingers had 2 coats, with the exception of the middle, which is just one. This is almost electric teal in it's intensity - it's on that line where teal starts flirting with royal blue. There's also microscopic pieces of black and white to add contrast to the mix - and what an exceptionally arresting mix it is. My only complaint is that it is a little hard to manoeuvre around the nail. It's one of those polishes that is hard to apply precisely, and (a bit like Floam) a bugger to remove if you end up colouring outside the lines. I also didn't end with a glacier smooth finish, but I think that was because it was 11pm and I really couldn't be bothered to be perfect lol. So the surface of mine is a little lumpy, but I'm sure some Gelous or another layer of Poshe would have sorted that out. And the best news of all? This isn't even Kae's best polish, but you will see that in a couple of weeks. For now, you can feast on The Hungry Asian at her Etsy store here.